I need to put a table/grid of info on a website and I want it to be responsive so it looks good on all devices ( yes, that is what responsive means so I didn’t need to add that extra info ) …. On the day I originally wrote this post I could not find what I needed… but today I tried again using a different search phrase… “Bootstrap 3 layout generator” gave me a couple results that look promising! Read on to view the two results I found. jetstrap pricing starts at $24 a month ( April 2014 prices ) . They offer discounts if you pay annually and have a 30 day money back guarantee. http://www.layoutit.com is the first solution that I found … but it seems to still be in beta and not working too good yet… I wasn’t able to download the code the generator was creating ( kinda defeating the purpose eh ). It looks very promising though. No prices or plans yet. This is the editing interface from http://www.layoutit.com . It lets you drag and drop rows, columns, tabs, carousels, images, lists, etc. It then allows you to preview what it will look like in the browser. http://www.divshot.com looks quite promising… but it was broken for me in Firefox and Chrome :(. It generates layouts for Foundation Framework, Bootstrap 3,2,1, and another called Ratchet. There are several more Bootstrap editors to be found on this Mashable article. 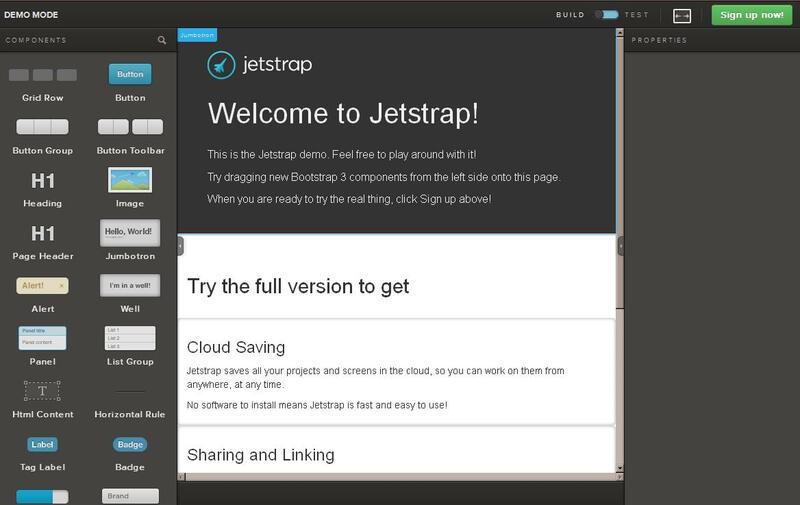 Background on why I was looking for a Bootstrap layout generator….